This summer has yielded the most relentless hot weather I have ever experienced. When it comes to my hair, the best hairstyle for this blazing heat is a high ponytail or bun. No bangs, no pretty curls...just swept back and up. 1) Brush your hair back & up and secure it into a high ponytail with a ponytail holder. 2) Pull your ponytail through the holder just enough to make a loose, hanging bun. 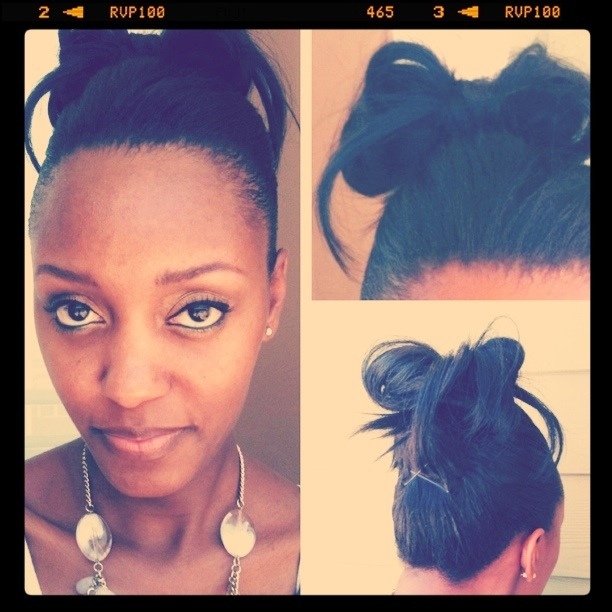 3) Take a small section of your bun from the front & center and pull it forward, releasing it from the ponytail holder. (I used the short section from my bangs) 4) Wrap that section of hair under your ponytail holder and pull a part of it forward to create a small puff. Blend the rest of it into the loose bun. 5) Pull a few strands of hair from both sides of your bun and release them from the ponytail holder, making them the hanging parts of the bow. 6) Style as desired and make it your own, unique hair bow bun!